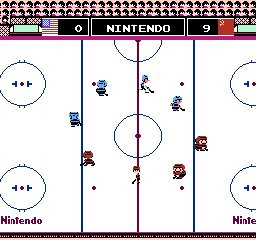 The earlier titles in the NES sports series are probably not remembered by many for being great games, but Nintendo’s Ice Hockey — a latecomer to the series in 1988 — certainly bucks that trend. It is fondly remembered as a semi-faithful translation of the sport which was fiendishly addictive to play and hard to put down. Ice Hockey allows you to build your team from a selection of three body types: heavy, normal and skinny. Of course the skinny players are the fastest but can get pushed around easily. If you want to intimidate other players we recommend getting a slow but fearsome fatty on your team; if you want to play it safe you can opt for a normal sized gent. Pick and match to suit your playing style. An ice hockey game would not be complete without fighting, of course, heck it’s the most interesting aspect of the sport! When players lose their tempers a large fight erupts and you have to button bash your way to victory. Most other hockey games go for the Street Fighter style one-on-one fight so this is a little bit unique. The control of the players is very fluent. You basically just shoot and pass when you have possession of the puck or switch players and tackle when playing in attack. It’s all nice and simple as you would expect from a game of this era. 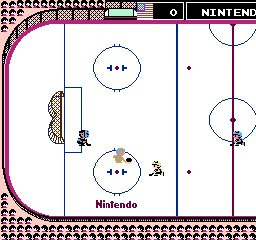 Unlike non-ice hockey each team only has five players and there are only a small number of teams to choose from without any real variety. When compared to the dreadful NES Sports Soccer which came a few years prior to this, the differences really show. 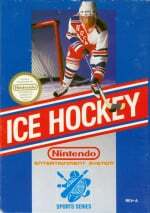 Ice Hockey is just a joy to play; playing the CPU will keep you entertained for a while, but the game truly shines when competing against a buddy. Many NES fans claim that Konami’s Blades of Steel — which was released at the same time — is a superior game, but we think there is not much between them. Besides, who knows if it will ever make it to the Virtual Console? Until it does you could do a lot worse than to download this. Come on. You give this game a 7 but Ice Climber a 5? That's because Ice Climber sucked! I'm kidding of course, but as far as I'm concerned this game is an 8 and Ice Climber is a 4. I never did understand what the appeal of ice climber was supposed to be.